The hype was strong with this one. So strong that I finally broke down and spent some money (well, gift card credit, let’s not get crazy) to buy it. While I did end up enjoying it, it didn’t quite live up to the hype for me. 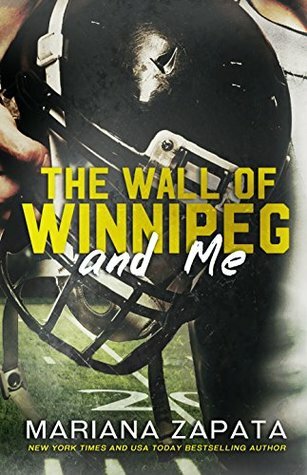 I’m a fan of a good slow burn romance and that’s what The Wall of Winnipeg and Me seems to be known for. However, I was not quite prepared for how sloooooow paced the whole story was. The chapters were pretty long, as well. I thought that it was really over-written for the most part. I think a little more editing could have cut the length of the book and the repetitiveness, as well as improved the pace. Despite those issues, though, the writing did drag me into the story pretty quickly and I felt like I really got to know the characters. I went back and forth on how I felt about Vanessa. Sometimes I just didn’t understand how she reacted to things and she frustrated me. She was a little overdramatic at times, but she was pretty likable overall. Aiden also frustrated me for a big portion of the book. I am not a talkative or well-spoken person by any means, but he barely had any dialogue for about the first 20% of the story and I had no idea how I would end up getting to know him at all, let alone like him. Thankfully, he opens up as the story goes on and I did end up really liking him. Overall, I enjoyed The Wall of Winnipeg and Me, though the long chapters and very slow pace were a struggle for me at times. I liked the fake relationship/marriage of convenience angle, even if it was missing a lot of the elements I expect to see with those. I ended up loving it once it got to about the last third or so of the book (minus the graphic scene it saved for the end) and that is why I’m bumping my rating up from what I was originally going to give it. While I wasn’t completely blown away by this like so many others were, I think it’s one that I will probably read again in the future. 4 stars is still good, but gotta hate when the hype builds up your expectation! Agreed! I’m maybe a little bit generous with 4 stars, but there were things I really liked about it, even if it lacked in other areas. Your review is spot on! Exactly how I felt about it. It was way too long and drawn out. The slowest burn I’ve ever read. Could’ve cut half the book and still got the same point across. I did enjoy it, just wished it was shorter. I don’t know how people re-read this one over and over again. Lol. Her other books are just as long and drawn out, so FYI. I really liked Wait For It – but it’s a very slow burn, too. Thanks! Yeah, long books are not my cup of tea and it’s usually because I feel like the pace is too slow and there’s no reason for it to be so long. I think there’s a difference between a slow burn and a slow pace and you can still have the slow burn with a brisker overall story pace. I’ve been thinking about trying out Kindle Unlimited and I saw Wait For It was on there, so I’ll give it a try when I do that, but I don’t see myself buying that. Thanks! I did enjoy the slow burn. Just much longer than I prefer. I agree!! It could have been cut a lot shorter. Thank you! I hope you enjoy it when you get to it. It’s good, but prepare yourself for a pretty slow pace. Sorry the burn was too slow for you. I never thought I’d be saying that to you! 😉 I’m glad you could still enjoy it, though! Very nice review. Lol. I was ok with the slow burn, I just thought the story pacing over all was a little too slow. But, I still liked it! Oh sorry you spent money on this and didn’t love it! I don’t normally love slow books but for some reason I liked this one. I listened to the audiobook and loved the narrator. I also listened to Kulti and is it the same way. I’m glad you enjoyed it, despite the slow pace. Everyone seems to love it. I did like it more than I usually like hyped books, though.